Wasabi! I hope everyone is having a great week so far. We only have one day left now so make it count! I returned to an old fave for breakfast today. 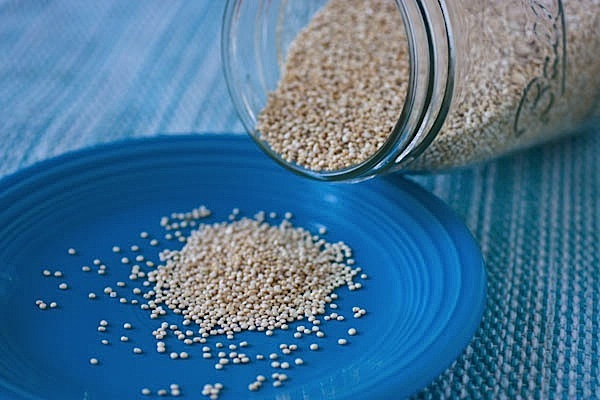 I started by cooking up a medium sized batch of plain quinoa. 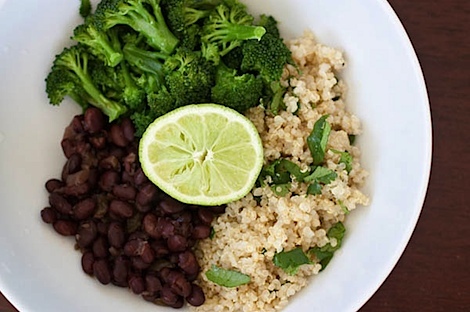 I made a Breakfast Quinoa Bowl (similar to this one) to enjoy first thing this morning. I plucked a single kale leaf from the garden from some greenery, and I made a quick garlic-tahini sauce for the quinoa. 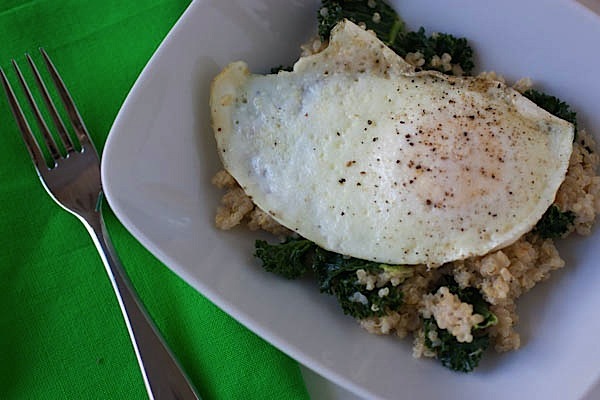 On top – a cage-free fried egg. Nommmm! I love quinoa over eggs. Have you tried it yet? Dooo ittttttt! I also had some fresh organic strawberries. I’m so excited that the good season for produce is coming around now. I can’t wait for fresh berries and other veggies at the local farmer’s market. I’m also hoping to make it to a strawberry farm this year! I haven’t been in too long. Guess who found a new favorite spot in the house. Bailey has moved over to this couch. Don’t you just want to curl up with him? Since I had so much quinoa already cooked, I decided to utilize it in lunch, too. 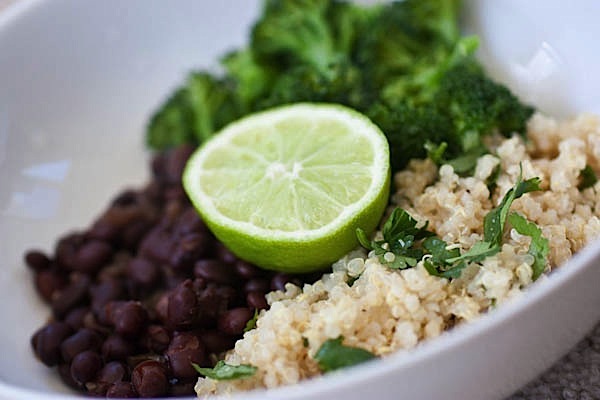 I heated up a can of TJ’s cuban black beans, steamed some local broccoli and made a quick herbed quinoa pilaf with cilantro, lime juice, extra virgin olive oil, salt and pepper. 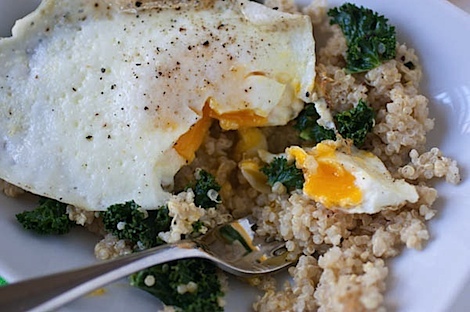 This meal was quick, easy, and made almost exclusively from the pantry. Gotta love that! I sure did and gobbled everything up in a matter of minutes. I especially liked the local broccoli – it was more tender and flavorful than the regular stuff in the grocery store. 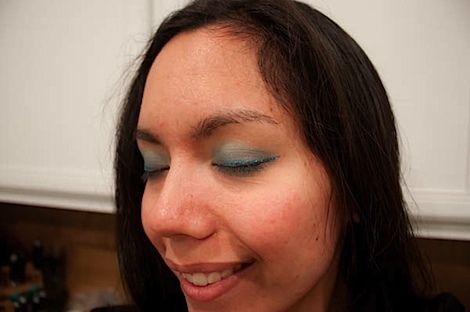 After work, it was time to get glam with my glitter eyeliner to teach Zumba tonight! I had another energy-charged class with lots of fun girls! Oh and don’t let me forget this blast-from-the-past pre-workout snack. Anywho, today I decided to add some organic strawberries to my oatmeal snack since I had them in the fridge. After cutting them up a bit and stirring them into the oats…oh-em-gee…it tasted just like my old-school fave – strawberries ‘n cream…only BETTER! 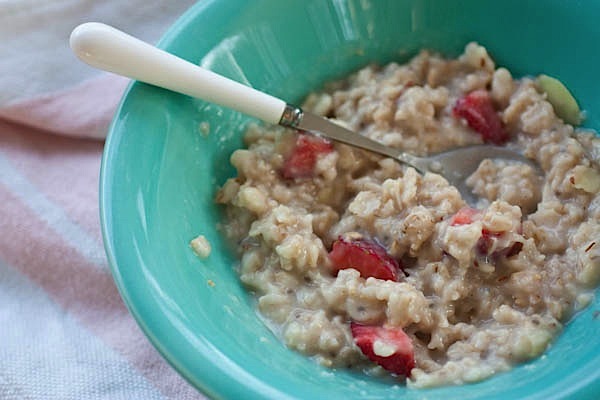 The chewy texture from the rolled oats, the bright strawberry bits, and the creaminess that gave off that melt-in-your-mouth feeling. Yum! I was sad when it was gone, but it was the perfect portion for a pre-workout snack. This freshened up version of a classic gives you all the sentimental flavor with more wholesome ingredients and fresh, crisp berries. 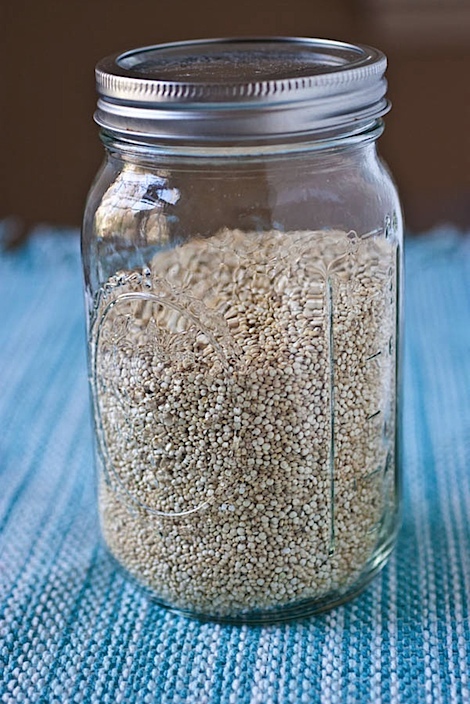 Combine oats, rice milk and chia seeds (if using) in a small pot and mix up. Cook over medium low heat until mixture is thickened up to your liking, stirring occasionally. NOTE: Try to keep the oatmeal hot but not boiling. 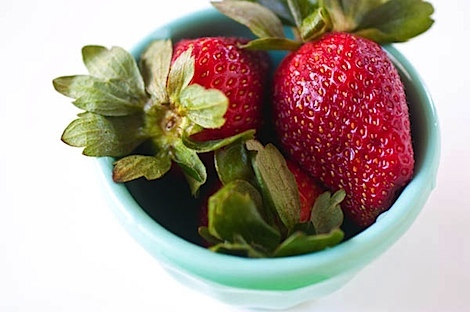 Stir strawberries in and cook until they’re warmed through, about 1-2 minutes. Serve in a bowl and top with sliced almonds if you’d like. Did you eat oatmeal as a kid? What was your favorite flavor (of pack or with random mixins)? 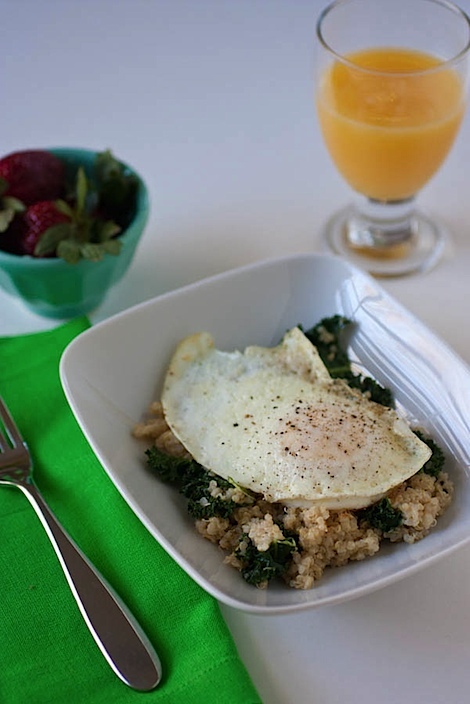 I can’t decide which I want to eat more, the breakfast quinoa bowl or the strawberry oats!! I have been seeing lovely strawberries around the blog world… I need to pick some up! 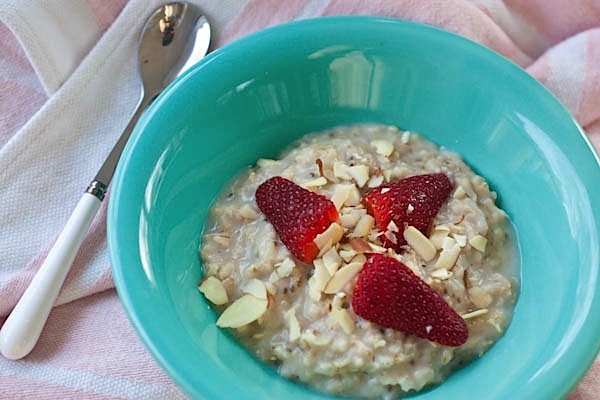 Mmmm that oatmeal looks amazing and i’ll admit my fav zumba dances are the ones to new pop songs, i download them on itunes and run through the choreography in my head while i’m on a run in an attempt to remember the routines, i have an awful memory! What a beautiful meal–looks so fresh and delicious! 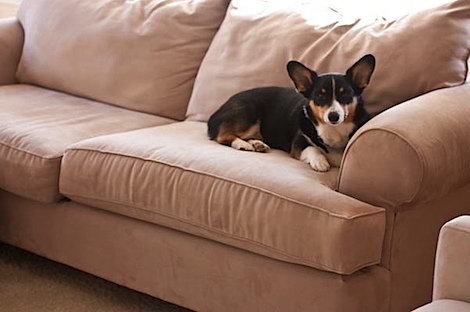 I DO want to cuddle with Bailey on the couch! Food looks delish. I love cilantro! Adds so much flavor. And who wouldn’t want to cuddle with Bailey!? So cute! Love the eyeshadow! By the way, I’ve recently got into doing the Zumba DVDs and I’m obsessed. It is so much fun. I don’t care if I am doing it right or not! 🙂 I used to love the Quaker Oats Maple Brown Sugar packets when I was a kid. I’d go through them like crazy! I love the idea of runny eggs on almost anything – well food related things! LOL! I have to try to incorporate quinoa into this mix b/c I have been plain and sticking with the toast. I loved oatmeal! Brown sugar was my favorite, but I loved this one kind that had dinosaur eggs in it that melted into dinosaur sprinkles. Not healthy at all, but sugary deliciousness. 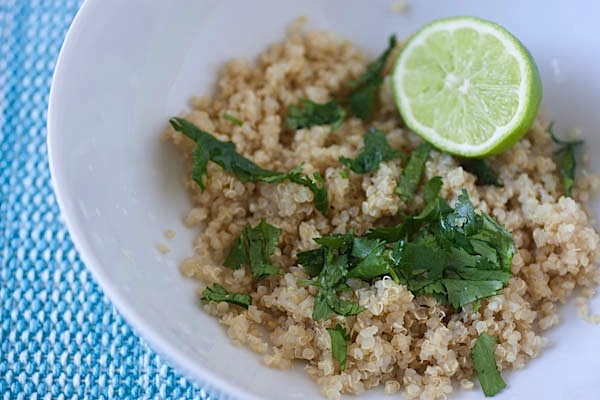 I have yet to try quinoa after my first mess up. But it is still on my list of must trys. Oh no…what happened the first time?